If you’re looking for ground coffee to suit your brewing device, look no further. Here at Two Chimps Coffee, we tailor your coffee orders and coffee subscriptions to exactly how you want them. That’s why when you order ground coffee we grind it to match your brewing method. That way everything’s just right and you coffee tastes awesome. How do different coffee grind sizes make a difference? The size of the grind can make one of the most significant differences to the taste you get when you brew. Different grind sizes will extract the coffee at different speeds which can lead to ‘over’ or ‘under’ extraction. For instance, if your grind is too fine for your brew method, you will notice that your coffee can taste bitter. If you go to the other end of the scale and grind your coffee too coarsely, your coffee will be under-extracted and can taste sour. For example, if you are using a filter device, then this particular brewing method is gravity fed. You need to allow the water to drip its way through the coffee naturally. If the grind is too fine, the water will have to fight harder to get through the smaller, more compact ‘pieces’ of coffee and therefore the water will sit within the coffee bed for too long. This is called over-extraction. On the other hand, if you put a coarsely ground coffee in an espresso machine which requires pressure to extract the water, the water will ‘fall’ through the bed of coffee with ease as the gaps between the grounds are larger. This would be under extraction. It can sound complicated, however, it doesn’t have to be. If you are unsure about grinding, then fear not, we can do it for you. When you choose your freshly roasted coffee, tell us how you brew, and we will grind it to suit. If you are not sure, or perhaps you would like to try out our ground coffee before you subscribe, you can order a smaller, 50g, taster pack to try out in your brewing device. This means you can be 100% positive about the extraction, grinding and taste first. If you are really enjoying our coffee, you can subscribe to get sent it whenever you want! Whether it’s weekly, fortnightly or monthly. All you have to do is choose which coffee you would like and how you would like it grinding, and we will do the rest. Alternatively, if you’re feeling a bit adventurous, you can choose our mystery coffee. Each delivery you get from us will be a different coffee, but always ground ready for your brewing device. Not only do we grind to order, but we grind it just before the postman comes to collect so it is always at its freshest. We would also recommend, if you are ordering your coffee ground, to order little and often. With our fast and free 1st class delivery you no longer have to order in bulk. Order little and often to get the freshest ground coffee. There are lots of ideas and theories about how to store your ground coffee. We would always recommend keeping it in a sealed container or bag and out of direct sunlight. 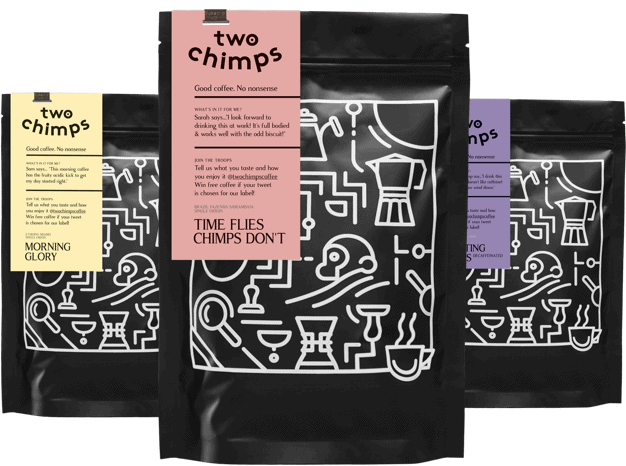 Our Two Chimps Coffee bags have a one-way valve which is ideal for keeping your coffee fresh. The valve lets the coffee gasses out but no oxygen in; they also have a zip seal for added freshness too. Alternatively, store it in one of our cool looking Two Chimps Coffee tins and leave it on the kitchen side to show off. Do you want to grind your own coffee? Even better! If you don’t already own a grinder, we recommend an adjustable hand grinder, like the Hario skerton grinder. This allows you to adjust the grind size to suit. You can grind little and often and, with its ceramic burrs, it accurately grinds your coffee at a consistent size. Happy days! You also get to fill your house or office with that awesome smell of freshly ground coffee – you can’t beat it. If you are grinding your coffee by hand and are a little unsure on what the best grind size would be for your brewing device, then fear not as this trusty guide will help you. Aeropress Coffee: we recommend grinding your coffee at a consistency similar to table salt. Espresso Machine Coffee: we recommend grinding your coffee very fine, similar to soft sugar. Moka Pot Coffee: we recommend grinding your coffee quite coarse, so it has a feel similar to rough sugar. Cafetiere Coffe: we recommend grinding your coffee, so it has the feel of castor sugar. Filter Coffee: we recommend grinding your coffee quite coarse, so it has the feel of rough sugar. Use this guide to start you on your way. Subtle adjustments in grind size can be made to adjust to personal tastes. Please do not hesitate to contact us if you need any help at all. Did you know that used coffee grounds can be re-purposed? You don’t have to throw your used coffee grounds away. Oh no, you can do so much more. If you have a compost pile, you can make around 20% of it from used coffee grounds. The grounds have nitrogen within them which, to a plant, is about as good as it gets. If you don’t have a compost pile, you can add your used coffee grounds to your soil as a fertiliser. The used grounds will bring organic material to your soil and plants, helping with drainage when watering, along with aeration. The coffee grounds can also lower the pH value in the ground which is great for plants such as Roses and Birchwood who love acid. Similar to getting your coffee brew ratio spot on, play around with the amount of coffee you add to your soil. Some plants love the coffee grounds, whereas other plants might not like it as much. Use a little bit on your plants to see how they get on and, if they love it, they’ll be reaping the benefits before you know it! For more information on what to do with your used coffee grounds, head over to our ‘Great News For Green Fingers‘ blog. So go on, have a browse through our range of coffees. Let us help to pick the best for you!